Bernard "Bajdo" Vukas (May 1, 1927 in Zagreb – April 4, 1983 in Zagreb) was a Croatian football player. He could play on all attacking positions in the team as well as attacking midfielder who start attack from deep and is mostly remembered for his extraordinary dribbling ability. In 2000, he was voted by the Croatian Football Federation as the best Croatian player of all Time, and in a poll by Vecernji List, he was voted the best Croatian athlete of the 20th century. Vukas started his career in the youth ranks of Concordia Zagreb. After WW2, he spent some time in NK Amater Zagreb before moving to Hajduk Split in 1947. He stayed in Hajduk until 1957, playing 202 games and scoring 89 goals. 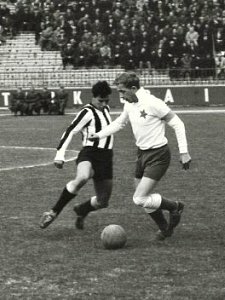 With Hajduk, Vukas won the Yugoslav First League title on three occasions, in 1950, 1952 and 1955, and he was the leagues top scorer in the 1954/55 season with 20 goals. In 1950, Vukas helped Hajduk win the Yugoslav First League undefeated, a record which has never been broken. In 1957 he moved to Bologna F.C. 1909, where he stayed for 2 years playing 48 games and scoring 2 goals, but his time there was overshadowed by serious illness. He returned to Hajduk in 1959 and remained until 1963, playing 65 games and scoring 5 goals. He spent his last days as a football player in Austria, playing for Austria Klagenfurt, Grazer AK and Kapfenberger SV. Counting friendlies, Vukas played a total of 615 games for Hajduk Split and scored 300 goals. On the 23rd October 1953, Vukas, along with Branko Zebec, Vladimir Beara and Zlatko Čajkovski, played for FIFA's 'Rest of the World' team against England at Wembley - in a match to celebrate 90 years of English Football Association. The match ended 4:4, with Vukas assisting in two goals and being awarded penalty. Two years later, on the 13th of August 1955, Vukas was invited to play for the UEFA-Team in a friendly match against Great Britain played in Belfast, where Vukas scored a hatrick. With Yugoslavia he won 2 silver medals in the Olympic games. For the Yugoslav national team, he played 59 games between 1948 and 1957, and scored 22 goals. He was also a part of the Yugoslavian team in the 1950 and 1954 FIFA World Cups. * In Hajduk, Vukas won Yugoslav league titles three times, 1950, 1952 and 1955, whereupon the championship of 1950 was achieved without a defeat. This record is still alive. * Twice the Yugoslav national team including Bernard Vukas won the silver medal at the Olympic Games (1948 and 1952). * In the 1954/55 season, he led the Yugoslav league as the top goalscorer, with 20 goals. * He played 615 games for Hajduk Split and scored 300 times. * On 21. October 1953 he played in Wembley for the "Rest of the World" team against England. The final result was 4:4. * On 13. August 1955 he was invited to play for the UEFA-team (Continental Team) in Belfast against Great Britain. The game ended 4:1 with a hat trick by Bernard Vukas. * He was also a part of the Yugoslavia team in the 1950 FIFA World Cup and 1954 FIFA World Cup. * In 2000 he was elected for the best Croatian football player of all times.